WHO AM I AND WHY AM I RUNNING? I am Ben Sanders, a Texas Businessman who has worked for liberty for 15 years. I want to be the next Comptroller of Texas because America and Texas are at a pivotal crossroads. My previous work experience includes positions at NASA and the U.S. Army. I hold degrees in biochemistry, computer science, and a doctorate in Business Administration. I am qualified and ready to lead. Our liberty and economic well-being will be lost if we do not act swiftly to maintain our sovereignty. I appreciate the fiscal dangers and hardship of my fellow Texans, and I have a plan to restore Texas. I am the only Comptroller candidate who has willing released their Tax Returns. If you can't trust and believe in your Comptroller to claim their Taxes correctly and honestly, how can you trust them to manage your money for the State of Texas. As the guardian of the state’s finances, the Comptroller serves every citizen of the state. Legislators rely on the Comptroller’s office to chart the course of the Texas economy, produce annual financial reports and estimate future state revenues. State agencies trust the Comptroller to pay their bills and issue paychecks to their employees. Local officials and businesses look to this office for economic development guidance and data analysis. And all Texas residents depend on our agency to safeguard their tax dollars and ensure that they are handled wisely. Drawing on my experience as the Financial IT Systems Administrator for NASA, I will publish an easy to understand budget that follows graphically the organizational chart of the State of Texas. Because it should never be uncertain where the taxpayer's money is being spent. The Texas Comptroller's office serves the state by collecting more than 60 separate taxes, fees and assessments, including local sales taxes collected on behalf of more than 1,400 cities, counties and other local governments around the state. As Texas' Cornerstone for Growth. The Comptroller's office administers the state's 529 plans and promotes local economic growth by identifying and fostering work force development initiatives across the state. The Comptroller's goal is to give all Texans a chance to succeed. This is accomplished through a variety of programs. Some programs help young Texans explore careers, others provide tools and resources to help parents save and pay for future careers and offer all Texans a way to contribute to those higher education dreams. As a long time advocate and support of STEMs programs, I know how vital these classes are to our young people's future success. It is my job to stretch every dollar with smarter spending. As the only candidate who is trained and certified as a Contracting Officer Representative by Defense Acquisition University. I understand how to run the State Purchasing teams and justly award and manage hundreds of statewide contracts on behalf of more than 200 state agencies and 1,900 local government CO-OP members. Thank you everyone for all your love and support. 2018 was truly a great year, with your support we received the highest number of votes of ANY Libertarian Candidate in a three way race for State or Federal office in Texas. With climbing numbers like this I'm reminded why I run, and it is because of all of you. To get our message out there and change opinion. Each year my platform and campaign planks become the actions and motivation the next election cycle. So we do indeed move the needle. 4 years ago I talked about unfair Property Taxes & Schools, now that is the agenda for 2019 Legislative session. This year I talked about fixing Pension Funds, and Healthcare, and I promise that will be the talk of the 2021 Texas Legislative session. Without you, and your support we couldn't do it, so I sincerely thank you from my family to your's. Four years ago as the 2014 Candidate for Texas Comptroller I warned the good people of Texas this was going to happen. Now it will because the people that were elected by Straight Party Voting don't have the qualifications to hold the offices they were elected to. I am qualified and ready to lead. 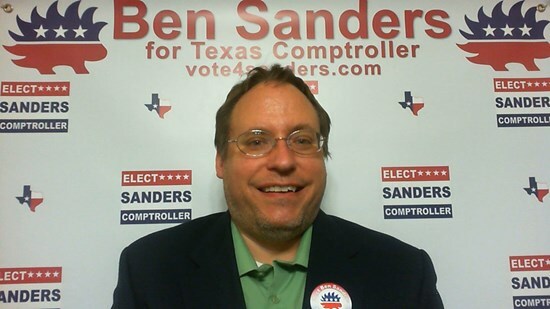 Ben Sanders is running for the office of state comptroller. He was unable to attend the forum but addressed the audience via webcam. He has previous work experience with the Army and at NASA. He feels that the comptroller position is a very important one for a Libertarian to be in. Sanders pointed out that the comptroller's job also involves not only collecting taxes but also spending it on the people's behalf. 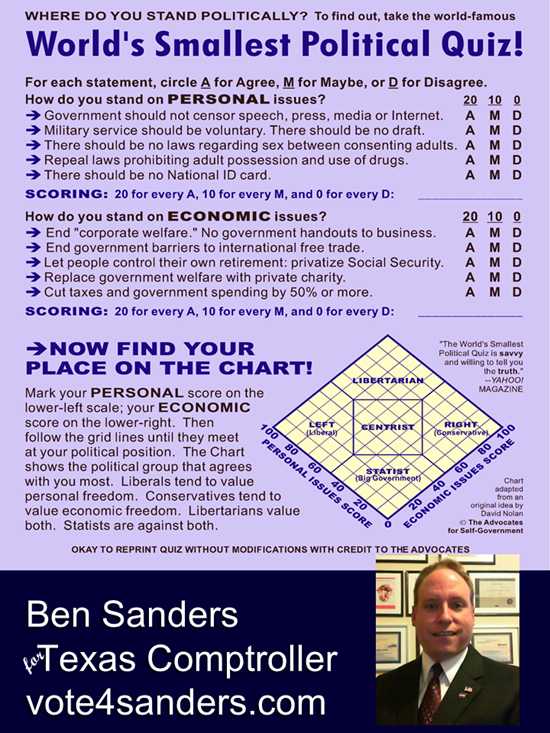 He wants to lead the office with conservative fiscal values and economic/social freedom. 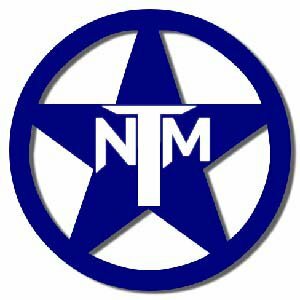 After submitting the surveyed candidates to a vote of their membership, the members of the TNM have chosen to endorse my candidacy for Texas Comptroller. It is a great honor to be among the candidates, to have the support and endorsement of the TNM.